WAIKIKI — Students at Jefferson Elementary School took part in a campus wide tsunami evacuation drill today to help the Hawaii Emergency Management Agency (HI-EMA) kick off Tsunami Awareness Month. April was chosen as a month to honor the 159 lives lost during a massive tsunami that struck Hawaii on April 1, 1946, and caused widespread damage to the state. At 11:45 a.m., outdoor warning sirens sounded as part of the monthly statewide test. It was also the moment when Jefferson Elementary students performed a schoolwide evacuation drill. More than 400 students, faculty and staff moved calmly and quickly in an orderly fashion to gather near the front entrance to the school for the drill. Normally, Diamond Head Theatre serves as the school’s evacuation meeting site since it is well out of the tsunami evacuation zone. Following the evacuation drill, students proceeded to the school’s cafeteria for a special presentation. School Principal Garret Zakahi was presented with concurrent proclamations by HI-EMA and Cindy McMillan, Director of Communications for Governor David Ige and by Peter Hirai, Deputy Director of the City and County of Honolulu Department of Emergency Management on behalf of Mayor Kirk Caldwell, recognizing April as Tsunami Awareness Month and the importance of tsunami preparedness and response. The Pacific Tsunami Warning Center (PTWC), headquartered in Pearl Harbor and operated by the National Oceanic and Atmospheric Administration (NOAA), monitors seismic data across the Pacific and Indian Oceans to calculate the potential risk of a tsunami. During a real life tsunami threat, PTWC will issue messages and statements to the public that interpret the scientific data and advise on the level of risk associated with the event. Warning A potential tsunami with widespread inundation is imminent or expected. Widespread, dangerous coastal flooding accompanied by powerful currents is possible and may continue for several hours after the arrival of the initial wave. Move to higher ground immediately. Advisory A potential tsunami, which may produce strong currents or waves, exists. Significant widespread inundation is not expected. Stay tuned to local media for emergency guidance. Watch A potentially dangerous distant seismic event has occurred, which may later impact the watch area with a tsunami. Be ready to take action if a warning is issued. Statement An earthquake has occurred or a tsunami warning, watch or advisory has been issued for another section of the ocean. In most cases, information statements are issued to indicate there is no threat of a destructive tsunami in your area. To find out if you live, work or play within a tsunami evacuation zone, turn to the disaster preparedness pages in your local telephone book or enter your address into the NOAA Tsunami Evacuation Zone Map Viewer on HI-EMA’s website at www.scd.hawaii.gov. 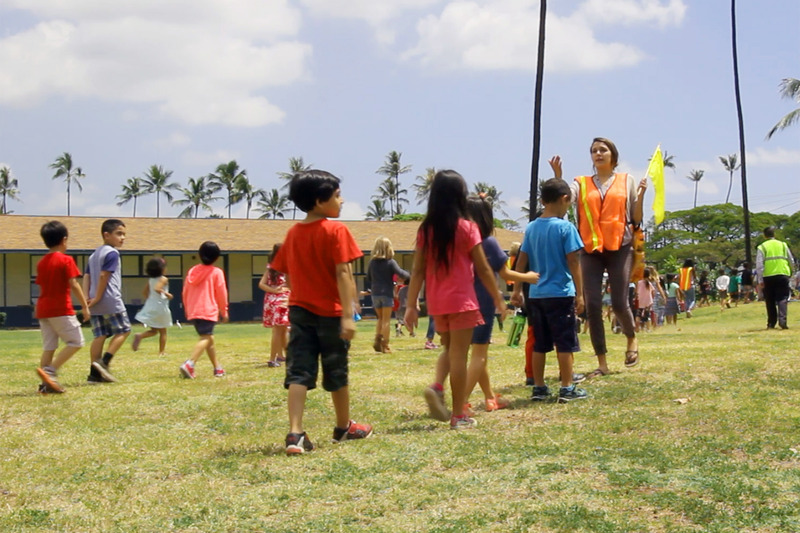 Caption: Jefferson Elementary School helped HI-EMA kick off Tsunami Awareness Month with an evacuation drill today upon hearing the outdoor warning sirens during the regularly scheduled monthly test. 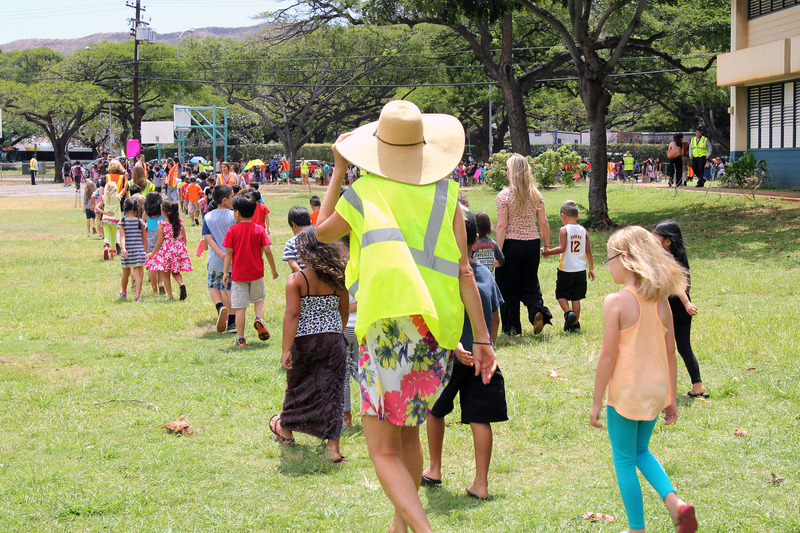 Caption: More than 400 Jefferson Elementary School students, faculty and staff calmly and quickly evacuated their classrooms and made their way to the front of the school during an evacuation drill for Tsunami Awareness Month. 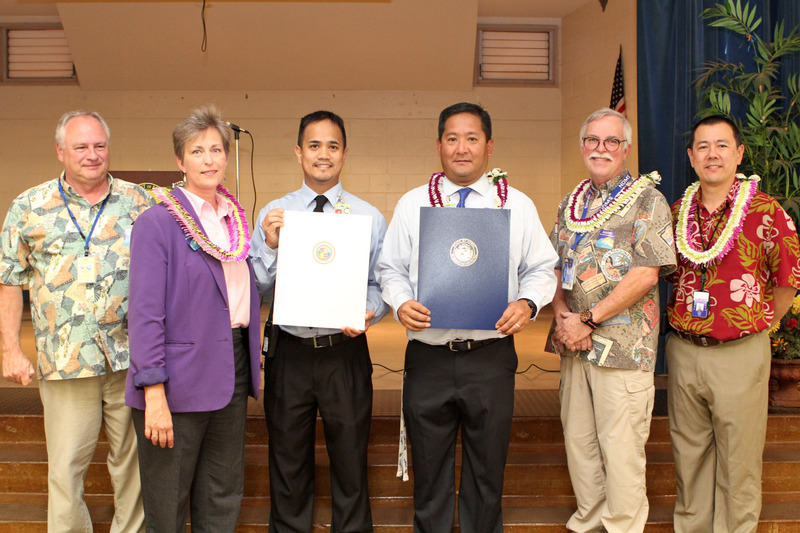 Caption: Concurrent proclamation presentation (From left to right) Kevin Richards, Earthquake and Tsunami Planner, HI-EMA; Cindy McMillan, Director of Communications for Governor David Ige; George Sanqui, Vice Principal, Jefferson Elementary School; Garret Zakahi, Principal, Jefferson Elementary School; Toby Clairmont, Executive Officer, HI-EMA; and Peter Hirai, Deputy Director of the City and County of Honolulu Department of Emergency Management on behalf of Mayor Kirk Caldwell.